The world premiere of Screen Ireland’s new Irish short films programme will debut at the 2018 Galway Film Fleadh, funded under the agency’s Short Stories and Frameworks schemes. ‘Frida Think’, ‘Procession’, ‘Mary’, ‘Q4L (quest for love)’ and ‘Honest’ make up the Short Stories programme premiering at this year’s Fleadh, while ‘The Wiremen’, co-funded under RTÉ and Screen Ireland’s Frameworks scheme will also be screened alongside the five other titles. In addition to the world premiere of Screen Ireland’s latest slate of new Irish shorts, this year’s selection will also include two special short film presentations — the world premieres of Brendan Gleeson’s directorial debut, ‘Psychic’, and Sean Mullen and Meelis Arulepp’s animated short film, ‘The Overcoat’. ‘Frida Think’ tells the story of a woman who walks into a party dressed as Frida Kahlo, only to find that her version of unique has mass appeal. The film is written and directed by Maya Derrington and produced by Paul Rowley of Still Films. ‘Procession’, is written and directed by Jeda de Brí and produced by Claire McCabe of 925 Productions. The film is set in a bedraggled community of misfits who gather to mourn one of their own, the only way they know — a raucous, elaborately eccentric, brass-band funeral. ‘Mary’ centres on Charlie, who, after managing to destroy the town’s beloved Virgin Mary statue, does the only thing he can do: frames his older brother. The film is directed by Shaun O’Connor, written by Jonathan Hughes and produced by Sharon Cronin of Character Films. ‘Q4L (quest for love)’, is written and directed by Antonia Campbell-Hughes and produced by Ailish Bracken of Against the Grain Films. Quest for Love sees Eve and her son Max move to Paris: but does Eve want motherhood or freedom? ‘Honest’, features a young boy whose confrontation with the Son of God makes him question his faith and helps restore his honesty. The title is written and directed by Matthew Roche and produced by Hazel Cullen of TW Films. 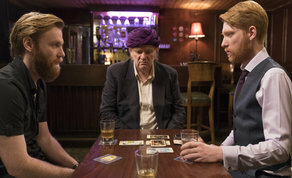 ‘Psychic’, which was written by Rory Gleeson, marks the directorial debut of acclaimed Irish actor Brendan Gleeson and stars Domhnall and Brian Gleeson alongside their father. The film tells the story of a charismatic psychic (Brendan Gleeson) who is forced out of retirement by his two manipulative sons (Domhnall and Brian Gleeson) and taken on the road. The last obstacle to gaining a large cult following is a TV show host determined to bring them down. Psychic is a dark and human tale of showmanship, the other world and family. ‘Psychic’ is produced by Juliette Bonass and Brendan Gleeson and is co-funded by Screen Ireland and Sky Arts. 'The Wiremen', is written by Paul Cahill, directed by Jessica Patterson and produced by David Minogue. When electricity is first brought to rural Ireland, a six-year-old girl believes an actual faerie has entered her home with ‘the Light’. Her attempts at capturing it unwittingly cause a blackout and ultimately summons the sinister, ghoulish creatures who haunt the surrounding countryside. The title was co-funded by RTÉ and Screen Ireland under the Frameworks short animation scheme. ‘The Overcoat’, is directed by Sean Mullen and Meelis Arulepp and was written by Hugh O’Conor. The film is a warm and unique Christmas story about an office worker who saves all his money to buy a new coat in time for Christmas, only to have fate take a ghostly hand. The Overcoat also features the voice talents of Cillian Murphy. The film is an Ireland-Estonia co-production, supported by Screen Ireland, BocPix, The Estonian Film Institute and the Estonian Cultural Endowment Fund. The Overcoat is produced by Jonathan Clarke at Giant Animation and Kristel Tõldsepp at A Film Estonia. The world premiere of Screen Ireland’s 2018 slate of short films will take place on Saturday, 14 July in the Town Hall Theatre at 12pm.